1? The International Accounting Standards Board, which issues the IFRS, is not independently structured, funded or operated. At the first sign of significant pressure, the IASB folded to political forces. 2? IFRS have been aggressively promoted, oversold and inappropriately communicated. 3? 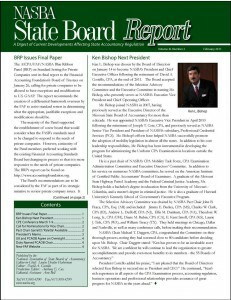 IFRS have been very poorly vetted, omitting input from the world’s largest accountancy regulator – the state boards of accountancy – and NASBA. 4? There is no evidence that any thought was given to what IFRS are supposed to look like in a country such as the United States. Should there be one set of standards or two, private vs. public, GAAP vs. IFRS, carve outs and the like? 5? Misinformation is rampant about IFRS. Regularly supporters state that over 100 countries have embraced IFRS, when only 47 have fully adopted them. The total GDP for those 47 countries comprises 4 per cent of the world’s GDP, which is roughly equivalent to the GDP of California plus Georgia.